Joe: Hello, guys, thank you so much for doing this. I really appreciate your time. By the way, I love what you’re doing, I think nutrition is such a hugely important and underrated thing during cancer. I really want to understand the link between cancer and nutrition. I want to start with your personal stories. Like, how did you get into it and how did that connection between nutrition and cancer, how did that come about? Let’s start with you, Elise, first. Elise: Sure. Look, for me, Joe, I was somebody who was always very passionate about health and fitness. Growing up, I was involved in a lot of sport, from athletics to basketball, swimming, tennis. From a young age, fitness and nutrition was something I knew that I wanted to pursue long-term. I initially decided to do dietetics because I thought that I wanted to work with athletes with sports nutrition. As time went on, I started to develop a real appreciation for the importance of nutrition and the impact that it can have, particularly in the context of cancer. For patients not just during their cancer treatment, but also into survivorship as well, so reducing their risk of future recurrence. What I also found was that these sorts of patients, we can have a huge impact on their life. I gained a lot of fulfillment and a lot of self-worth through helping these people through one of the most challenging journeys of their entire life. It was from them that I realised, nutritional ecology was something that I wanted to specialise in, but also to dedicate my working career to. Joe: Yes, that’s fantastic. I also feel like you guys are also privileged to also be working with real athletes. That’s for sure, thank you, on my behalf. Lauren, what about you? Lauren: Well, I had a similar experience to Elise, in that I always had a real passion for nutrition and health overall. My interesting nutrition and dietetics came more about through the science background. I really enjoyed chemistry and biology and health sciences at school, but I also really enjoy psychology. What I found through studies was that the use of nutrition as a therapy is not just a biological and a chemical therapy, it’s very much a psychological and a social therapy, as well. Yes, food is nutrients, food is chemistry, but it’s also our social life, our environment, our psychology and emotions. Being able to marry those things together in a career to help support people was a no-brainer. Yes. Joe: That makes so much sense, because that really puts that whole perspective of treating the whole of a person and putting it in that larger context. Lauren: Absolutely. I think Elise and I get a lot of our job satisfaction and fulfilment and enjoyment not so much from the science of the chemistry and nutrition therapy that we’re offering, but through empowering people with knowledge and education to make their own health choices and improve their own health. 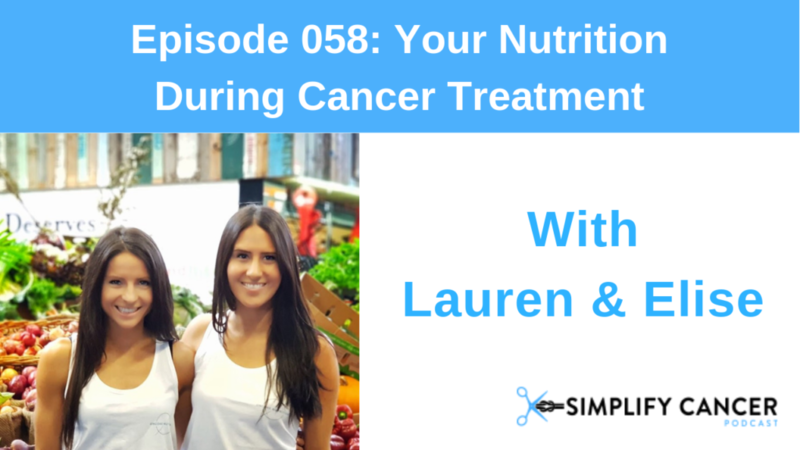 Joe: Tell me, Lauren, what is nutrition important during cancer treatment? Lauren: A massive question, but it is so incredibly vital during cancer treatment. If we look at any type of cancer therapy, be it chemotherapy, radio therapy, any biological or immune-based therapies and surgery, there’s such strong evidence that nutrition prior, during, and after any of those treatments can significantly improve treatment outcomes and treatment tolerance. There’s a really strong link between someone being well-nourished before and during their treatment, and their long-term survival outcomes. Joe: Yes, that’s fantastic. Elise, tell me this, if someone is about to start treatment, maybe they’re about to start chemotherapy or radiation, or maybe they’re going to have some sort of surgery, is there any type of nutritional advice that you can give before they actually get started, because typically there’s a window there? Elise: Yes, absolutely. What’s important to note here, Joe, is that every individual is very different. As well as every individual being different, every patient’s cancer treatment, diagnosis, also has a huge impact on their nutritional status, but also the recommendations that we’d be providing. I guess in general, recommendations for someone who would be starting treatment or would be going through surgery is making sure that their muscle mass and their lean body mass is thriving. The reason for that is, we know that the stronger someone is, the better their outcomes are going to be during treatment, but also post-treatment, as well. Certainly, we do recommend for a lot of these patients going on some sort of high-protein diet in the leadup to their chemo or radio therapy, also, surgery, as well, just to ensure that we’re keeping their bodies really nice and strong, so that they can tolerate and cope with the treatment well. Joe: Great. Is that what’s called pre-hab? Elise: What’s really interesting, Joe, is that the presence of cancerous cells in the body can significantly increase our body’s nutritional needs, the metabolic demand. Simply by having a diagnosis, somebody’s nutritional requirements can increase by 150 percent. They need to eat for one and a half people before they’ve even started any type of treatment. That can be a real challenge, when first if that information is not delivered to the person who’s in that situation, but secondly, if they’ve got any type of side-effects that hinder their ability to eat and drink. Lauren: What we do know is that a lot of patients actually present to us with side-effects before they’ve even started treatment. For a patient with tongue cancer, they might have pain when they swallow, or they may have issues chewing. They’ve haven’t even started treatment yet, so you can imagine how difficult meeting their nutritional requirements are when they’re already presenting with symptoms before we’ve even thrown chemotherapy or radiotherapy in the mix. Joe: Wow, that’s a real eye-opener. I never really thought about it that way. I know that you guys are so big on providing information that is evidence-based. Can you talk about what that is and why that’s important? Maybe we’ll start with you, Lauren, first? Lauren: Yes, certainly. I think a huge pillar to our care as dietitians is that the advice that we provide to any individual is not only tailored to them, their own personal and treatment plans, their own goals, but certainly it needs to be information and knowledge that’s been well-researched and proven to be effective. What we know is that there is such a wealth of information available to every man and his dog out there. It’s very easy to come across information that may not be suitable for each individual. Elise and I, as dieticians, are very passionate about providing information that’s well-researched and backed up strongly by the highest quality evidence. Joe: Yes, exactly, because I know how frustrating it is to see things that you know are not true. I remember just going through chemotherapy and I remember being in a bookshop and I remember looking at all of these books that are saying: Stop cancer by eating… I was like, no, that’s not even true. Lauren: Joe, it’s so frustrating and so challenging for us knowing that there is so much misinformation out there, which is part of the reason why Elise and I decided to start our own business and try to enter more into the world of the broader public, so that we can be a bit of a voice of reason and provide that information that’s scientifically sound and reliable. Elise: Yes, I think where a lot of people out there go wrong is, everybody tries to instil fear in someone, “You can’t eat that, or you’ll die.” “If you drink this, you’ll get cancer”. Everyone wants to make a huge impact because at the end of the day, that big impact, that scare tactic, that’s what sells books, that’s what gets hits on blogs, that’s what gets the likes on social media. Unfortunately, ethically, there are a lot of people out there who are putting that sort of information out into the media and into the public and vulnerable people, people who have cancer, are getting hold of that sort of information. That can be really detrimental. Not just physically, but also emotionally, as well. Something that we see a lot of in practice is, people are scared to eat certain foods. There’s a lot of fear and anxiety around eating. That’s particularly around a lot of that misinformation that’s out there in the media. Joe: Cool, so let’s dig right into that. Tell me about some of the biggest myths and misconceptions that really exist around nutrition during cancer? Lauren: Yes, I think probably the biggest one that we hear is the concern that sugar feeds cancer. Joe, I don’t know if that’s something that you ever heard? Lauren: Yes. Look, this is an area that we get a lot of questions about, the short answer is, yes. Sugar does feed cancer. That’s also a very irresponsibly short answer. The long answer is, yes, sugar feeds cancer, but so does every other nutrient that we eat. If you take away sugar, cancer is then fuelled by protein and by fats. It’s irrelevant whether or not sugar is in the mix. Cancer, unfortunately, it finds a way to grow. Elise: Yes, cancer cells are really greedy. Their primary source of energy that they prefer to take will always be carbohydrates. Obviously, carbohydrates are broken down into sugars. As Lauren said, once all of those sugar stores have run out, it will then start to metabolize fat and protein. Starving your cancer cells or your cells from carbohydrates or sugar is not always the best answer because it will also be metabolizing your muscle and fat stores, which obviously you need to protect you during the treatment, as well. A lot of what we find is, a lot of people that try to cut out carbs or reduce any sort of carbohydrate intake, it can actually be detrimental to their long-term out comes. Joe: That’s really important to know. Is there anything else that comes to mind in terms of things that people get wrong? Elise: Yes, so another common misconception is the alkaline diet. Have you heard of that, Joe, as well? Joe: I’ve heard the name, tell me more. Elise: Yes, look, the theory behind the alkaline diet is that cancer cells can’t exist in an alkaline environment. Similarly, to sugar feeds cancer theory, the short answer to that is yes, they can’t survive in an alkaline environment. Lauren: Some of them can, some find a way. It’s also not necessarily true. Elise: Where a lot of that research is, is in a lab or in test tubes. If we put cancer cells in an alkaline environment in a test tube, they don’t thrive as well. However, in the human body, that’s very much different to a test tube. Now, our body maintains a very right balance of our PH, so our acid and base balance. No matter what we eat or drink, that actually doesn’t have any impact on our acid and base balance, or the alkalinity or the acidity of our body. Lauren: Of our bloodstream or our tissue. What we know is that the food that you eat, if it’s an alkaline or an acidic-based food, it will change the PH of our waste. Yes, it will change the PH of our urine and of our faecal matter, but what’s really important is that it doesn’t change the PH of our blood system or of our body tissues and organs. That is so important. Joe, if what we ate changed the PH of our blood, we would all be so unsafe. We’d all be hooked up to massive machines in ICUs everywhere. Elise: Filtering out all of our blood. Lauren: One really frustrating thing when it comes to diets that are proposed to cure or manage cancer, is that they’re often really restrictive and they often irradiate or recommend people avoid really important food groups. The alkaline diet in particular, for example, is wonderfully full of plant-based foods, and lots of vegetables, which is great. It disallows fish, it doesn’t allow some nuts and seeds, and grains, which are really valuable for our body’s function overall. Any diet that’s proposed to cure or treat or manage cancer certainly raises alarm bells, because we know without question from huge bodies of research that unfortunately, there’s no particular food or eating pattern or diet that has been shown to prevent or cure cancer. Elise: We wish there was. Joe: What are you tell me, you guys? There’s no magic wand? Lauren: If there was, it would be part of our conventional therapy. It’s really challenging when we’re then presented with people who have been restricting their diet and spending lots of money or putting lots of energy into changing the way they eat, that doesn’t have any impact on their cancer outcomes, but more importantly, it’s financially and socially really stressful. 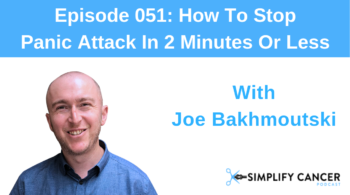 Joe: Yes, exactly because it puts so much pressure on you, pressure that you don’t need when you’re dealing with treatment, because you could be using this willpower to deal with other things, to deal with your treatment or with other things in your life. It’s really good to know that there is no one-sided solution, like a diet to just really keep you through it, what about supplements or vitamins? I know that’s also some of the possible misconceptions out there, that possibly we should be eating vitamin C or whatever. What are your thoughts on this? Elise: Yes, that is an interesting question, Joe, because supplements and vitamins are now a very big part of our culture. Most people that you know will be on some sort of supplements. I guess where this school of thought is, is that the more supplements that you take, or the more nutrients that you’re putting into your body, the better, and the more nurturing you’re being to your body. Now, this theory isn’t always correct. What we do know with supplements is that if they are, particular supplements are taken during treatment, so particularly radiotherapy. If antioxidant supplements are taken during that time, that can actually interfere and down-regulate the effectiveness of the radiotherapy. What antioxidant supplements do, now, whilst they’re very healthy and good for a normal person, when you’re undergoing radiotherapy, what the antioxidants do is, they don’t only protect your healthy cells, but they protect cancer cells, which we don’t want. We actually want the cancer cells to be sensitive to the radiation. A lot of people don’t know that. A lot of people are unaware of the impact that these sorts of supplements can be having on their treatment, which is why we always recommend to all of our clients to make sure that if they are taking any sort of nutritional supplements, that they’re discussing that with us and their oncologist, as well. Joe: Cool, so that’s really important to know. When it comes to just eating well during treatment, what are some of the most important things to keep in mind, I guess some of the rules of thumb, so to speak. I know, because every situation is different, but what are some of the important things to keep in mind and to focus on in terms of specific foods or eating patterns when you’re dealing with cancer treatment? Elise: Yes, look, as we said, there’s a lot of to be said about getting a tailored individualised plan, because every diagnosis and also every treatment will come with their own special requirements when it comes to nutrition. As a general rule of thumb, it’s very important to try and eat a balanced wholefood-based diet. What you were talking before about nutritional supplements and different vitamins and minerals, we know that they can often cause more harm than good. Also, they shouldn’t be required if we’re following a really balanced diet. There’s a lot to be said for meeting your nutritional needs through real food. Wholefoods as a priority. For me, it’s really important to ensure that your body is getting enough protein. That’s related to the additional requirement that our body has when we’re going through different types of cancer treatment. Again, the need for protein is often at about 150 percent of what it normally would be. Not eating for one but eating for one and a half people. That’s really key to help preserve not just your weight during treatment, but more importantly, your muscle mass during treatment. 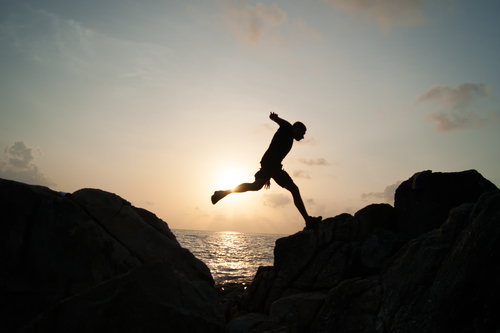 We know maintaining your muscle mass preserves your strength, your immune function, your ability to recover after every cycle or every treatment after your surgery. We know, long-term, it’s really important for your outcomes, survival outcomes. Also, for your long-term health and making sure you still have a really strong metabolism that’s not going to see you put on weight later on down the track. Joe: That’s huge. What are some of the best foods when it comes to protein? Lauren: Yes, so some really valuable sources of protein most often come from animal sources, so meat, chicken, fish, eggs, and anything dairy-based are really powerful sources of protein. In particular because they all tend to have what we call a complete amino acid profile. They have all of the essential amino acids that we need each day in those foods. There’s also some amazing plant-based sources of protein. Things like tofu and Tempe, some grains like quinoa, seeds, nuts, chia seeds in particular. One of the very few plant-based sources of protein that’s got a complete amino acid profile. It’s really valuable particularly if you follow a vegetarian-based diet during cancer treatment, to chat to a dietician and make sure that you’re getting the right amount and balance of protein across the day. Joe: Yes, absolutely. What about the situation when you’re going through treatment and it’s changing your taste buds? It’s affecting the way you eat. What sort of advice do you have on managing that, Elise? Elise: Yes, so taste changes are a really common side-effect generally from chemotherapy. It can also occur from radiotherapy, as well, particularly if you’re having that delivered to the head and neck area. Ways to manage taste changes, we usually recommend the addition of extra herbs and spices to help enhance the flavour. Adding extra sauces, as well, can be a really powerful tool to help mask taste and add a little bit of additional texture and flavour, as well. For some patients who experience a metallic taste in their mouth, usually we recommend using a cardboard plate or plastic utensils rather than the stainless steel, which can often be of assistance as well. I don’t know, Lauren, is there anything else? Lauren: One thing that can really help is keeping your mouth really fresh and clean just before a meal. We often recommend cleaning your mouth and brushing your teeth after you’ve eaten. When you’ve got alternations in your taste buds, having really fresh clean mouth before you start eating can help you make sure that whatever taste profile that you’ve got left, you still get to sense it. Elise: Yes, so it could be sucking on mints of a lemon drop. Lauren: Doing a mouthwash beforehand. Elise: Even some patients have said mineral water can be quite good to help break down any mucus or secretion. Lauren: Everyone’s a little bit different in this space, Joe. In that, some people lose their taste, some people taste every really amplified, or other things just taste like cardboard or metal, or really strange flavours. A lot of it is based on trial and error and figuring out what works best for you. Joe: Yes, I think it’s also important, to keep in mind, I’ll just throw this in there, that it’s so important to realise that it’s most likely going to go away. I remember going through chemo and all the things that I loved, like coffee, it just tasted… it was crap. It was horrific. Elise: We always say, what tends to go first is coffee and red wine. Lauren: Chocolate I hear, as well. Elise: All the finer things in life. Keep those nice bottles of red for another time. It will come back. Buy the cheap stuff now. You’re a cheap drunk. Lauren: Look, Joe, there’s also some preliminary research on particular amino acids and the impact that they can have on our taste buds. Unfortunately, at the moment there isn’t enough evidence to support the use of these amino acids. It’s certainly an exciting area. Certainly, when there’s more research that’s proven and evidence-based, we’ll be recommending that, or at least talking about it and presenting the evidence. Joe: How do you guys keep on top of this stuff, because obviously you have your business, but all of this new research comes out all the time, so how do you keep on top of it and how do you know what’s going on? Elise: Joe, we love it. Lauren: Yes, we’re passionate. This is what we’re passionate about. Elise: We live it and breathe it. Lauren: When one of us finds a new journal article or a new paper, or even a new fad-diet that’s just come out on the internet, we usually send it to each other, have a discussion about it. We like to write blogs, do research. I think it really helps that we love what we do and that we’re passionate about it. I know it sounds corny, but that saying: If you love what you do, you never work a day in your life. It feels like that sometimes because I don’t mind sitting there and reading papers. Everyone’s on the couch watching TV or out for dinner, we’re sitting there reading peer-review journal articles. Joe: Yes, that is pretty geeky, guys. Elise: We’re lucky we found each other. That we can get excited about science together. Joe: Yes, so you can geek out together. That’s pretty cool. All right, guys. Next, I wanted to ask you about exercise. I know it’s such a huge thing, but exercise and movement, they got hand-in-hand with nutrition. What’s your perspective around that especially when it comes to cancer treatment? Lauren: One thing I’ll mention first and then I’ll get Elise to speak to this later is that, the world cancer research fund recently had published a new set of guidelines with a really powerful statement that all cancer survivors, so anyone with a cancer diagnosis, past or present, should be referred to a nutrition specialist in oncology and an exercise specialist in oncology. Blanket. Absolutely everyone. All cancer patients and survivors should have access to dietetic and exercise physiology or physiotherapy care. I think that just highlights how important nutrition and exercise is throughout the cancer treatment journey. Both of them are so powerful, not just physically, but emotionally and socially, as well. Like you said, they marry together so importantly. Firstly, if you’re exercising, you need to nourish your body well, but also the combination of a good nutrition and exercise routine can really set yourself up for better health throughout your treatment, as well as longer-term minizine risk of any issues in health down the track. Elise and I are really fortunate, we work really closely with a brilliant group of not only physiotherapists, but exercise physiologists, Pilates groups, yoga groups, that work in the space of specialty cancer care, so that we can continue to provide our nutritional support, but alongside that exercise prescription which is really key to the health of these people. Elise: Absolutely. It’s so important, as dietitians, we work really closely with these exercise physiologists or physios because at the end of the day, our goals will compliment theirs and vice versa. At the end of the day, that’s what’s going to get the best outcome for our patients. Joe: What are some of the best activities that you would recommend for people during treatment? Is it yoga? Is it going for a walk? What are some of the things that you think are most helpful in that? Elise: We’re not exercise physiologists, so we probably shouldn’t be recommending particular exercises, but certainly it’s really important to keep active. It usually should be what feels comfortable for the patient. If that patient things that they’re able to go and see the physio or go and complete their exercise physiology session, by all means. Sometimes when they’re feeling too unwell, too fatigued, it’s important to listen to your body and to take that time to rest and recover. Maybe just a brisk walk would be appropriate for those days straight after your chemo when you’re feeling a bit crap. Lauren: There might also be days, Joe, when you can only make it to your letterbox and then you walk back home. That’s okay, too. The simple act of putting on your runners and making it that far is nurturing your body and giving yourself a chance to get out there in that space. I put it to you, what sort of exercise were you able to manage throughout your journey? Elise: Your friend the IV pole. Joe: My friend the IV pole. I would walk around the ward and it made me feel better. It made me feel like I wasn’t just stuck in bed, that I could talk to people, I could look out the window. It made a huge difference. I would highly recommend that. I think that is aligned with what you guys are talking about. Elise: It makes you take on a health role as opposed to a sick role. That’s a really important mindset to get into, as well. Look, I think it would be really valuable to – we can certainly put you in touch with some amazing people in the space of the exercise and oncology world that would be great to share their knowledge. I know that there are areas of exercise that can actually sensitise the body to respond better to chemotherapy and different kinds of cancer treatment. Hugely powerful space, certainly, like nutrition, it’s underestimated in the oncology world. Joe: Fantastic. I’d love to take you up on that later. Absolutely. Tell me, guys, what happens when eating is difficult, maybe you’re fatigued, or maybe on the other hand, you don’t have enough appetite, what do you do there? Lauren: They are really common symptoms that we see very frequently in our practice. Usually, the easiest strategies to implement is to have small and frequent meals. Often, after chemotherapy or radiotherapy, or even after a really significant surgery, as you can probably – it probably resonates with you, Joe, trying to tackle a really big meal is overwhelming and can also make you feel a little bit sick. We usually recommend splitting it up into five or six small meals a day, so that it’s not so overwhelming and so that you can get that little bit extra in over the day. Often, grazing, as well, is a really powerful strategy. Sipping on nourishing fluids, so whether that’s smoothies, protein shakes, if that’s appropriate. Fluids like that, which are, again, give you that little bit of extra energy and protein. As well, fortifying your meals, so adding extra oils, nuts, and seeds, even adding butter. Avocado, to help boost the energy in your meals is going to help you, firstly, to get in more calories, but particularly it’s important that you get in more protein. Adding additional protein sources to those meals, as well. Elise: A lot of that, too, Joe, is like you said before, about building habits and building routine. Often, we do it in a step-wise process, if there’s just no appetite and no desire to eat, step one is to put something, anything in your mouth every couple of hours. It might be one cracker or one nut. That’s okay. We build upon that base. Ultimately, what we want to try and achieve is small meals often that provide your body with the nutrition you need each day. It’s really easy to graze across the day, the graze on foods that don’t give you the full nutrition profile that you need. That’s where building upon that base is really key. Joe: Tell me, guys. I’m just about to learn the meaning of a new word, what is grazing? I have this feeling of me going out into the backyard and starting to chew the grass. Elise: We’re actually both champion grazers, I would say. We practice what we preach. The grazing is just having small snacks or just eating frequently throughout the day. That might be while you’re sitting on the couch just having a handful of nuts, a bit of fruit here and there. As opposed to a sit-down breakfast, lunch, and dinner, it’s taking some of that structure away from meal times. In some ways, the opposite of what we would normally recommend is making your eating a little bit less structured, a little bit more mindless, so that there’s less attention and pressure put on that meal time. It’s more about grazing gradually and snacking gradually across the day to get enough in, rather than relying on those structured meal times. Lauren: It’s a lot easier, isn’t it? Lauren: Another powerful strategy, Joe, is eating in a positive environment. Eating with loved ones. Even when you’re going through treatment, if it’s going out to a restaurant that you really enjoy, making eating and food more of a celebration rather than a chore. Even enlisting support from family members and friends to prepare meals or put things in the freezer, so that if you’re not hungry or you don’t feel like getting in the kitchen and cooking, that you do have food that’s available that’s nourishing and that’s tailored and appropriate to your needs. Joe: Yes, I think it’s also in a way giving yourself permission to eat what you want. I remember being stuck in hospital. The food was all right, but I think after a while, I just really had enough of it. I remember my wife was sitting next to me and I was like, I just can’t handle any more of this. Let’s just order take out. We had someone deliver. I don’t remember what it was, I think it was pizza, delivered it to the ward. Elise: You wouldn’t be the first, Joe. Joe: Yes, sometimes it just works well I think to break it up and give yourself the permission to do whatever you feel like doing right now. Lauren: What’s so hard is, you picture a hospital ward and a hospital bed, someone going through really intense treatment, the environment that they’re required to eating in bed, with the tray. A meal that’s been delivered to them, that is just not ideal for someone who doesn’t have an appetite. Elise: It’s not appealing, it’s not going to stimulate your sense. Certainly, we know through working those environments, when that’s presented for you, even for a health person that’s not going through chemotherapy, it’s not that appealing. Lauren: Nobody wants to eat in their bed. Breakfast in bed, maybe. Elise: Maybe on a Sunday, but that’s about it. Lauren: Look, we know, Joe, that there’s no culture in the world that advocates for solitary eating. No culture recommends that you should eat alone. What Elise was speaking to before was bringing that social element back to food and taking the focus away necessarily from the nutrients that you’re eating and more around the nourishment of your body from a more holistic sense. Joe: Yes, exactly, that’s perfect because I think that brings us to another misconception there, because I think a lot of people feel, I’m speaking certainly about myself at a particular point in my life, that healthy eating, whether that’s during treatment or otherwise, is about denying yourself the foods you love. Can you speak to that? Elise: Yes, that’s exactly what I was talking about before, Joe, about how people want to in order to sell books or get hits, they want to instill fear in the reader or in the audience. That fear for a lot of people is a sense of control. People believe that if they restrict a certain nutrient or avoid a certain food that there are actually nourishing their body or doing the right thing in order to help their condition. Where, it’s actually very much the opposite. It causes a huge amount of stress, anxiety, and can also fracture relationships, as well. I’ve had lots and lots of clients who’ve had wives in the room with me when the husband is really sick, in tears, just saying, “He won’t… he’s restricting this sort of food or he’s not eating that.” The stress that those restrictions puts on relationships is profound and can have even more of an impact than the treatment is having. Lauren: I think what’s really key is that we focus on the foods that will do you good and that are positive to your health, as opposed to those that are going to impact any sort of negative health outcome. Yes, it’s important to find balance and not to have your entire diet filled with foods that aren’t necessarily conducive to good health, but we know that much of our food supply is really good quality food. If we focus on those and the positive impact that’s going to have on our health, it’s a much nicer space to be in. Joe: Yes, exactly, so it’s all about turning around and having a positive mind-frame as you’re dealing with treatment? Lauren: Yes, for sure. Restriction we know, firstly, it’s very challenging, and doesn’t last. What for? You’ve got to ask yourself, why you’re restricting that food and certainly if there’s a really strong medical reason or rationale for it, certainly, we’ll support you in that. If it’s for a superficial meaning or some other advice that’s been provided without real merit, that’s when it can be really challenging. Elise: Is it really worth it? If it’s putting stress on you emotionally and financially, as well as your family, is that restriction really worth it? Joe: Yes, cool, that makes so much sense guys. If someone wanted to find out more about you, maybe read your blog, or work with you individually, as well, what could they do? Lauren: They could absolutely reach out to us, Joe. We’d love to hear from anyone. Elise: We’d love to hear from you all. 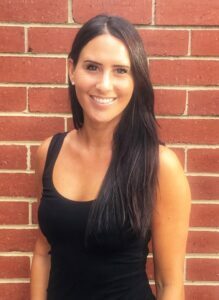 Lauren: Elise and I are very fortunate to have two clinic locations in Melbourne, soon to be three. Elise: Soon to be three. Lauren: At the moment, we practice out of clinics in Brighton and in Windsor, in Melbourne, and soon to be in Caulfield. We also offer phone consultation services through our tele-health program. We’re very accessible for anyone. We’ve got lots of clients both nationally but internationally, as well. If there’s anyone that we can support through their cancer journey with nutrition advice tailored to them, we’d be very happy for them to reach out to us. They can do so either on our website which is: www.oncorenutrition.com. On Core cleverly spelt: O-N-C-O-R-E.
Lauren: Certainly, we’re accessible by email, we’ve also got a range of information available on our website, both in the form of fact sheets tailored to different cancer diagnoses and treatment types, but we also write plenty of blogs and articles and have recipes available on our website, as well. Elise: One thing we encourage is if anyone listening has any requests or is unsure of any sort of dietary methods, please send us an email because chances are if you’re asking those questions, there are probably heaps of other people out there who also need those questions answered. Lauren and I would be more than happy to help support you. Joe: Fantastic, thank you so much, guys. I really appreciate all of your advice and your time. Lauren: Thank you for having us, Joe. Elise: We’re also really enthusiastic about building our community and providing that evidence-based reliable information to everyone who’s able to access it. We’d really encourage anyone who’s interested to jump online on the socials to join us, we’ve got Instagram, Facebook, LinkedIn. We’ve got mailing lists. We’d really welcome anyone who wants to join our community. Joe: Yes, you guys have a great newsletter. I think I received a new one today. Lauren: Do you like our jokes, Joe? Joe: Not really. I love your recipes, as well. It’s all cool. I think it’s great. You guys are going to make it fun and I think that’s what it’s about. I think it’s all about combining really actionable advice, but also having the right attitude and mindset, which is so important when you’re dealing with cancer. Elise: Absolutely. It’s an absolute privilege to have had a conversation with you about just that today, Joe. Joe: Fantastic. Thank you so much, guys. Lauren: Thank you so much for having us.